The turkeys are being thawed and the preparations are ramping to a fevered pitch as we anxiously await the convergence of family and friends to celebrate Thanksgiving Day! A great American tradition of gathering together and giving thanks for all that we have. If there is one thing that has remained the same since the first Thanksgiving in 1621, I think it is this. While we are excited to be with the family that will gather and celebrate, we are reminded of those who cannot be with us, those who are unable to travel or those we have lost. Of those who originally departed on the Mayflower less than 50% were around to celebrate the following year. This year some people will celebrate great successes while others will celebrate simply surviving. The real cause for celebration that first Thanksgiving was the second, not only had they survived a tremendously difficult year but they had new hope of a better life that came from a more stable food source. The most basic of human needs was restored to them. While most people know the story of the pilgrims leaving England to escape religious persecution, I think there is more we can learn from their story and the history of Europe leading up to 1620. The "Act of Uniformity" was actually passed in 1559 by the English Government making it illegal to not attend services at the Church of England with fines for missing each service and more severe punishments for practicing any other faiths. A group known as the 'separatists' wanted to practice their own version separate from the churches teachings and two of their early founders were executed in 1593 for their 'crimes.' But notice the time frames, it was 34 years before the founders were executed and another 27 years after that before the pilgrims sailed. And all of this transpired 128 years after Columbus discovered America. So, if things were so bad why the delay? Two of your founders are executed for trying to set up a new religion, which by the way was still based in Christianity, and that isn't enough to cause urgent action instead you choose to wait 27 years then finally figure out you have to leave? I don't think it took 27 years of planning to get 100 people on a single boat. There were a various excursions to the new world, so there were multiple chances to escape this unbearable oppression. But, maybe that isn't the point. Let's look at another astounding historical example of the human response to unbearable circumstances and the response. The "Black Plague" or "Black Death" was a pandemic that spread across Asia and Europe reaching its peak between 1346-1353. The estimates range from 75-200 Million deaths which equates to 30-60% of the European Population falling prey to this disease. These are astounding numbers and yet the real story of the plague is really more about what happened before to even make it possible and the lack of response. The events prior to massive outbreak created the perfect environment for this deadly pandemic. The combination of malnutrition due to famine of various causes coupled with a lack of sanitation in large cities allowed for the rapid spread of a disease. I know, not exactly Thanksgiving dinner conversation but the point is just like the pilgrims what seems to be missing is the sense of urgency. In both cases, I wonder what the discussions were, "well, we've lost 20% of the population, I wonder how much worse it can get?" then a year later, "well, we've lost 30% of the population, maybe this is serious?" For some reason, we human beings tend to disregard the warning signs and take early action instead deciding to see if it will get any worse before we act. So why is this important? As George Santayana famous quote says “Those who cannot remember the past are condemned to repeat it." When is it time for alarm or to take action? How many millions of people need to become ill with a disease before we decide to take action? How bad to things need to get before we decide to sail to a new world? Will history really repeat itself? Consider this, it is now estimated that 24 Million Americans have type 2 Diabetes. It is a slow insidious disease that is spreading across the world. But, maybe 24 Million people isn't enough to really worry about. Then let's add in the 78 Million American's who are in the pre-Diabetic category and without changes will become Diabetic in the next few years that gets us to over 100 Million Americans who will have Diabetes or about 1 in every 3-4 Americans. The good news is that more than 80% is preventable with lifestyle changes. So, as you celebrate the Thanksgiving Holiday and give thanks for everything you have remember to also think about your ability to make choices. We are seeing the warning signs of bad nutrition leading to the next pandemic but will we take early action or wait to see if things get better? Change will only come with accepting the responsibility for our circumstances and deciding that taking action is more important than the comfort of staying in the world we've created. I've received several questions about why I didn't write a book about physical therapy or wellness. This is the introduction to my new book Life Pioneers and hopefully this answers those questions. Is anything really possible? Can you really have anything you desire? Is the American Dream alive? If it is, can anyone access it, or is it just for a select few? In all honesty, these weren’t questions that I ever asked as a child. I grew up in a working class family, and there seemed to be a certain order to the world. Like all kids, my siblings and I talked about what we were going to be when we grew up and the dreams we had for our lives but, as the years went on, we began to realize there is a difference between dreams and what is actually attainable. Our conversations focused on what kind of job we would get, what city we’d live in, if we’d still have the same friends, and would they be our neighbors. It seems strange now, when I think back to my childhood and the dreams we had. It’s even stranger to think about my brothers and sister and the fact that we all grew up in the same home with the same parents and, yet, our life paths have been radically different. As I reflect back, I can’t seem to find anything that would have hinted at the divergence. I didn’t have a secret mentor that gave me access to any secrets of life. There was no businessman who took me under his wing and taught me the ways of business. There was just our family, and we all learned the same lessons, went to the same schools, and even had a lot of the same teachers. Nevertheless, my sister married a farmer, and they run a good sized farm in my home state, Montana; my brothers are both steadily employed in our home town, Helena; and I sit in the back yard of my home in California on a beautiful fall day pondering how, out of all of us, I have built a business with over 200 employees (www.myTERRIO.com). I have traveled to a lot (although not nearly enough)of incredible places but, most importantly, I see so many more possibilities to explore. Is anything possible? Sitting here now, I believe that it absolutely is. Can you really have anything you desire? I have come to believe that you can, given a few caveats. Is the American Dream alive? There is no doubt! I know because I have lived it and, yes, it is accessible to anyone willing to learn and grow. I’ve come to understand that one of my talents is the ability to connect pieces of complex and seemingly unrelated information and make it useful for others. I first realized this with my physical therapy patients. I quickly learned that they weren’t interested in all of the complex anatomy, physiology, and pathophysiology, they just want an understanding of what is wrong and what they need to do to fix it. I took the path into business of being a really good practitioner of my skill but, as the business grew, I realized that I wasn’t equipped with the knowledge and understanding I would need to continue growing my business. To correct this, I started learning from as many sources as possible: books, tapes, seminars, coaches, and mentors. I used my talent to apply what I was learning and continue growing the business through various stages. With success in business, I have been privileged to join YPO, Young Presidents’ Organization, and meet wildly successful presidents of companies from around the world, which has exposed me to even more possibilities. While the business success has been great, I realized that there were other areas that needed energy and attention. I have been blessed with an incredible wife and three amazing kids. I decided long ago that I wouldn’t miss their sporting events or school programs for business and especially not for any of my personal endeavors. I have taken the time to coach each of my kids in the sports of their choice and have enjoyed all of their plays and concerts. Could my business have been even more successful if I had focused solely on it? Maybe, but I don’t care because I wouldn’t trade the time with my kids. Could I have spent more time with my kids? Yes, and I hope that they understand that, when I did work long hours, it was to build opportunities for them that I never had, show them what is possible with hard work and determination and, yet, balance having time with them. Over the years, I have also become acutely aware of the need to stay healthy and how not devoting time and attention to this area can hurt all the other areas of our lives. As a medical professional, I have seen firsthand the impact of poor health, not to mention the incredible costs associated with it. I truly believe that health is the underlying foundation of all the other areas of our lives. Without good health, we do not have the energy to maximize the other areas. It is vital to make sure that we take care of ourselves so we can then take care of others. I am also a firm believer that health is not only physical but also mental and spiritual. It seems, in this information age or, as I like to call it, the ”age of distraction,” that our mental and spiritual health is suffering right along with our physical health. The percentage of obesity continues to increase and, along with it, chronic diseases like diabetes and heart disease. But we are also experiencing a chronic deprivation of spirituality and increasing mental stress. Our health needs to be a complete package. Finally, I believe it is vital to get involved in the communities we live in and seek out opportunities to help others. The world is waiting for people to step up and get involved, and it’s amazing the difference a little creativity mixed with action can make. I have helped to start two non-profit foundations. The League of Dreams, which is a recreational sports league for children with disabilities (www.ourleagueofdreams.com), and one that we just started working on, the Nathan Garcia Childhood Cancer Foundation. Available on Amazon or at all TERRIO Therapy Locations. Count the Costs! Can you afford it? Can you really be healthy? Will I ever be able to lose weight and keep it off? The percentage of Americans that are now considered overweight or obese continues to rise, in some areas of the country passing 60%, but at the same time there are reports that 95-98% of diets fail. You might think “So what! Yeah I could stand to lose a few pounds but what’s the big deal.” OK but consider this…Can you afford to be fat? Can you afford to be unhealthy? 1 in 4 deaths in the United States is due to heart disease. 1 in 3 adults (80 million) in the United States have some form of heart disease, stroke, or other blood vessel diseases. Number of heart attacks and strokes that occur in the United States: 1.5 million/year. Heart disease and stroke cost the nation $312.6 billion*/year in health care costs and lost economic productivity. At the current rate of growth heart disease will triple in the next 20 years. As you can see the economic impact of being overweight or obese is substantial and yet we are faced with the stark reality that 95% of diets fail so is there really a sustainable solution to this problem? We are immersed in the information age, with unprecedented access to information and yet we are failing at an extremely high rate. There are a variety of opinions out there about how to lose weight and get healthy, everything from 'the law of positive attraction', to 'prayer', to reading books or attending seminars with 'experts.' Is the secret to success and having what you want really as simple as sending out a 'prayer' or simply creating a desire for something you want and then it will find you? Most 'experts' tell us that the key is to write goals, not just any goal but a SMART goal (Specific, Measurable, Achievable, Relevant, and Time-based). Most New Year's Resolutions are perfect SMART goals..."I will lose 30lbs by June". Is that goal specific, yes. Is it Measurable, yes, just have to step on the scale. Is it Achievable, absolutely! Is it Relevant, it is if you have more than 30 lbs. to lose and is it time-based, yep, by June. Does it fail? Only 95-98% of the time. What if suddenly the priority changed and it was no longer something you wanted to do to look better, but something that a loved one needed to do? It all starts with a full understanding of yourself, why you believe what you do, where you want to go and preparing and executing that journey. 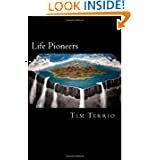 "Life Pioneers: The Edge of Possibility" can get the process started (available on Amazon and all TERRIO Therapy Locations). I will soon be announcing new programs to help people get control of their health and create the life they have always dreamed of but start planning out your journey today!! Order in the next 22 hours and get it by Monday, Nov 18. The Missing Step in Success. Hello world, how've you been? It has been a while since I last posted and its time to reconnect. In my last post I talked about the secret of success and how to get anything you want. Who doesn't love to hear a good story about the dreams we have and 'what we are going to be when we grow up.' As a child I used to sit around with my brothers and sister and we all talked about where we would go, who we would be and where we would live, it was awesome to have the whole world and limitless possibilities at our disposal. But as we age we are told to stop dreaming and get realistic. We are told and we begin to believe that there are not limitless possibilities and the whole world isn't accessible to everyone. We grow, we learn and for a majority of people we learn that there are barriers and obstacle that will block us. We hear stories about people who have tried to find a better life only to come back discouraged and the dangers that await out there. But, we also learn about a brave few people who defy all odds and find a new world, something that no one has ever thought of before, something we didn't know existed. What is the difference? What allows a select few to beat the odds and discover a new world? I believe the missing step is action, well with a twist. I truly believe that the secret of any success that I have had is embodied in this statement. We must learn and prepare, then take action if we are to improve. Over the last two years I have completed my Doctorate in Physical Therapy, Served as Chairman of the Board for the Bakersfield Chamber of Commerce, served as Chairman for my local Young Presidents' Organization, worked on developing a community wide wellness program, continued growing my business, coached my son's football team and written my first book ("Life Pioneers"). "Life Pioneers: The Edge of Possibility" is an autobiography of my life journey to help others map out their life journeys and is available on Amazon. All of this is to continue my life journey of trying to help others fulfill their personal potential. I have been preparing for the next journey and now its time to set sail.